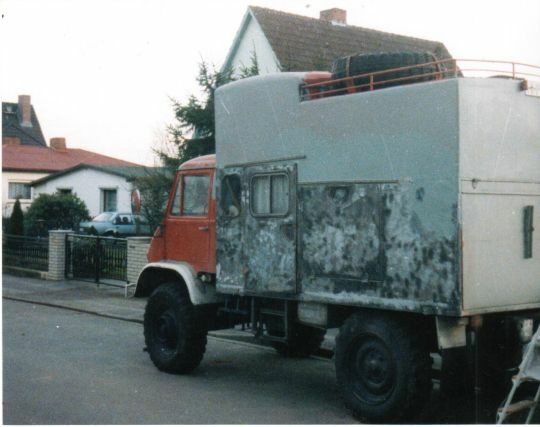 We needed more than 6 month for the modification of the engine and the first preparations of the "Hilfsrüstwagen" body to build up our "new" UNIMOG 404 camper. 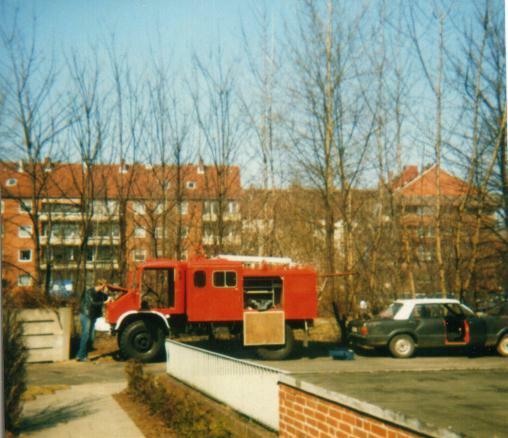 We have bought the UNIMOG 404 S from the fire-brigarde in Hamburg and brought it to the place where all the modifications took place. 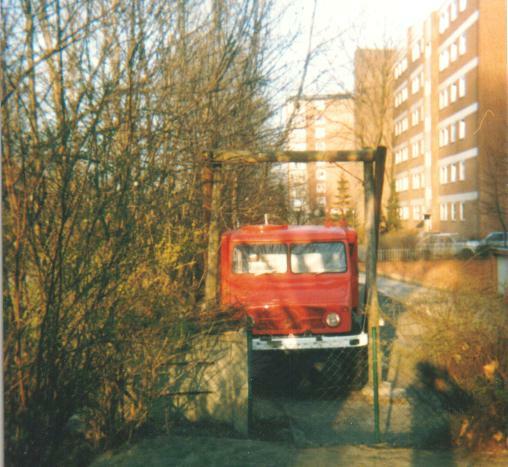 This is the only picture from our UNIMOG in the original condition. This is a part of the preparations for the change of the engine. 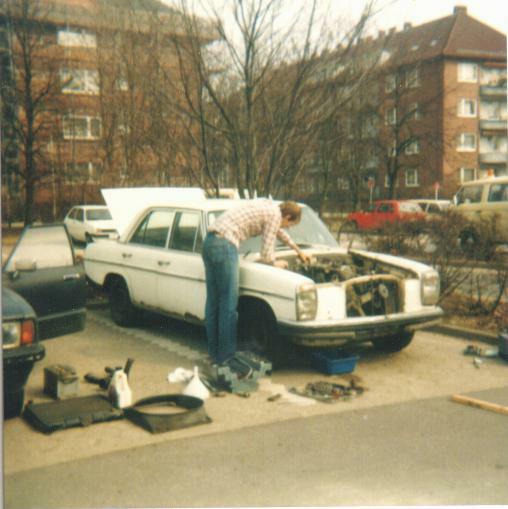 The original engine was completely brocken and therefore we changed it against a 220 diesel. 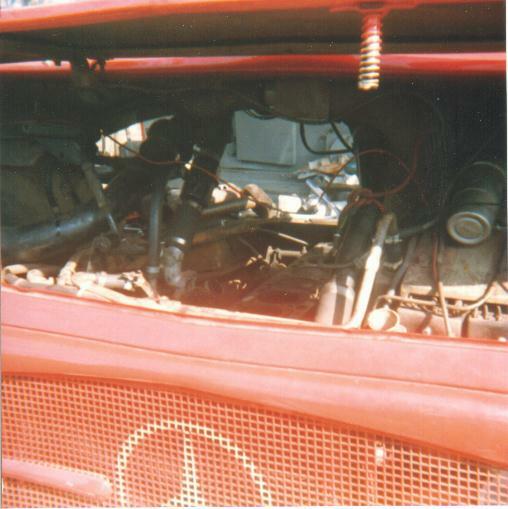 A view under the engine hood, the brocken cylinder head is already removed. 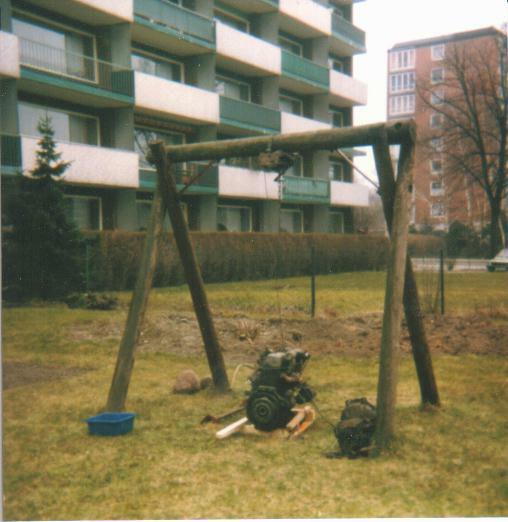 Now we removed the old engine with an old kindergarden swing and a used winch. 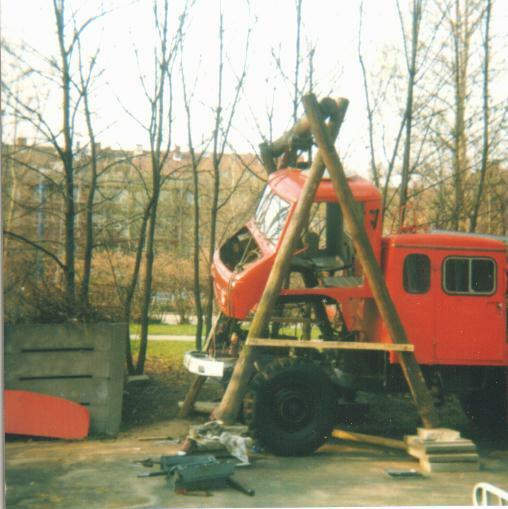 It took one day preparations to lift the driver's cab. Unfortenately we removed unnecessaryly the steering column, that took an additionally weekend to reconstruct the steering gearing. 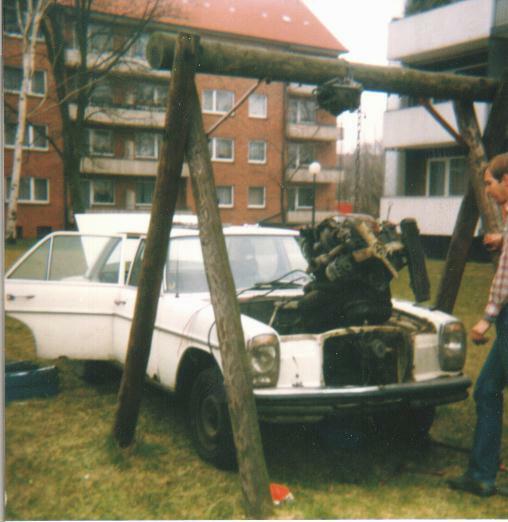 The Mercedes 220 D be bought to get the diesel engine for the 404. 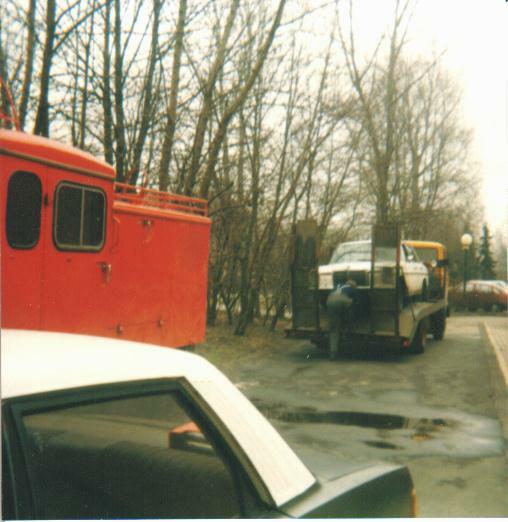 Finnaly here it is, ready for it's new job in the UNIMOG. 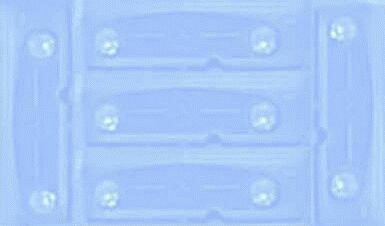 There is the rest of the 220 D on it´s way to the scrap. 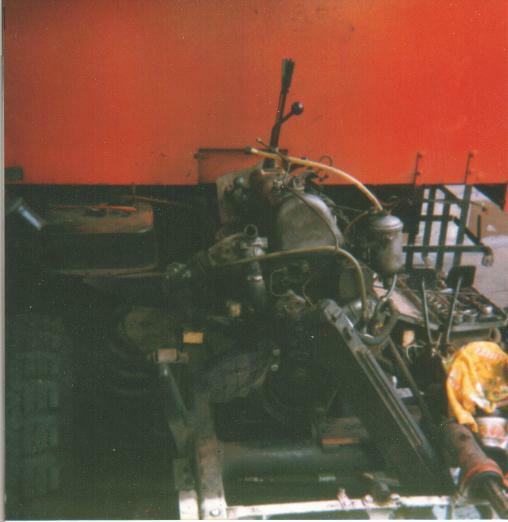 So far, the engine is build in, all new parts are hand made and special redesigned for the UNIMOG. 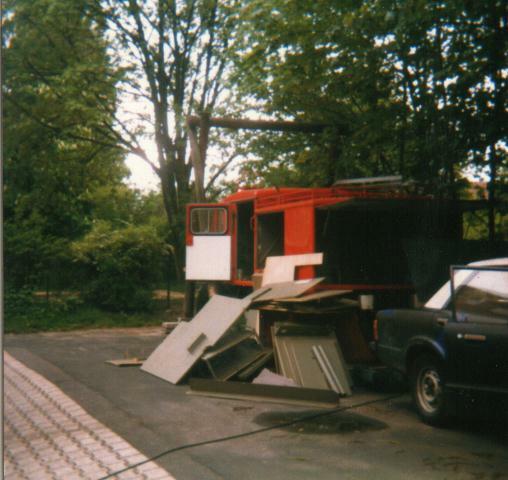 This is the rest of the contents from the "Hilfsrüstwagen" body. First modifications to use the UNIMOG as a camper. 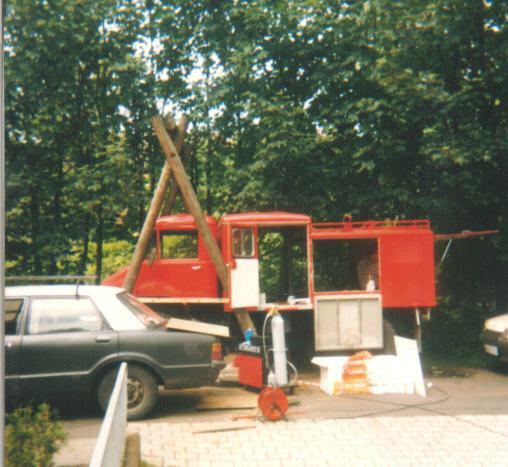 We made our first short trip with the orinal "Hilfsrüstwagen" body in the same year, but it was to low for a longer tour. After finnishing the main work, the old laquer need to be removed. This picture have been taken in summer 1988 before the trip to Schweden and Norway.